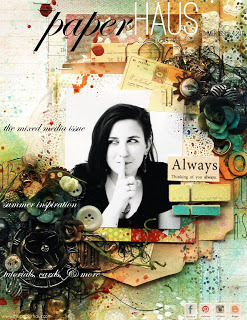 We are celebrating the release of the Summer Issue of PaperHaus Magazine with a blog hop! There is SO much inspiration, techniques, projects, and exclusive artist interviews inside this edition! Click on the magazine below to view the entire summer issue. It's truly ah-mazing!!! To ring in Summer, I want to share a page I made using the new Crate Paper "The Pier" collection included in the Gossamer Blue June kit. I will have more to tell you about designing for Gossamer Blue this coming week. In the meantime, run over there and scoop up one of these kits! It's filled with Lily Bee Design Sweet Shoppe and exclusive Lily Bee papers and stamps, Crate Paper, Basic Grey and more! I seriously feel so lucky getting to design with this kit!!! When I saw the frames in this collection, I knew they would be perfect for all these photos I took of my daughter enjoying Kiddie Park - a park my grandparents took my mom to when she was young and took me to when I was a young child. It was such a wonderful, nostalgic experience! I simply printed the photos to the frame sizes, adhered them to the back and then embellished around them. I added bits and pieces of embellishments under and over the top and then I chose 3 frames to stitch over and around. I will never forget the feeling I had taking my girls to Kiddie Park. There were even moments when I felt like I was actually reliving my childhood through them! Today, I am giving away a great RAK to one random commentor who is also a follower of my blog! I have been purging my craft room and lucky for you, the purge includes all sorts of recent collections. I just don't have room for it all! All you have to do is "Join" or follow my blog and leave me a comment. I will draw the random name and post it here on my blog. Last day to enter is June 8, 2013 at midnight CT. Your next stop on the hop is Katrina Hunt. Our Summer Delight event is all about fun summer days filled with scrapbooking and crafting! We want to share with you what we have made! Every day on the PaperHaus Blog there will be amazing inspiration and tutorials so be sure to stop on by everyday in June! Wow Heather! This is a nice one! I love the layout and in particular your cloud corner cluster! I'm a follower! amazing page, love, love, love all those slide! lovelovelove this lo!!!!! So much going on and so fun! I[m already a blog follower, thanks for a chance to win and for your generosity!!! Such an awesome multi photo lay-out! I really love the slides. Oh Heather, what a gorgeous layout full of fun and cheer!! Love it!!! Wow! So funny day! What a wonderful LO! Follow you? Are you kidding me? I followed you by every possible way. GFC, FB, Bloglovin and e-mail. This is a fantastic page. You used those frames so well and the stitching and embellishing. Marvelous. Of course it doesn't hurt to have one of the cutest little girls ever as the subject, either. Great job! What a great layout! I love all the frames and the stitching. So fun! Thanks for the chance to win some goodies! Love your layout. I"m really beginning to love the mini frames. So much potential ! I follow your blog via email as daisiesgirl@gmail.com and I am a member of your blog as Taunya Butler. My comments show up on your blog from me as TJ Butler. 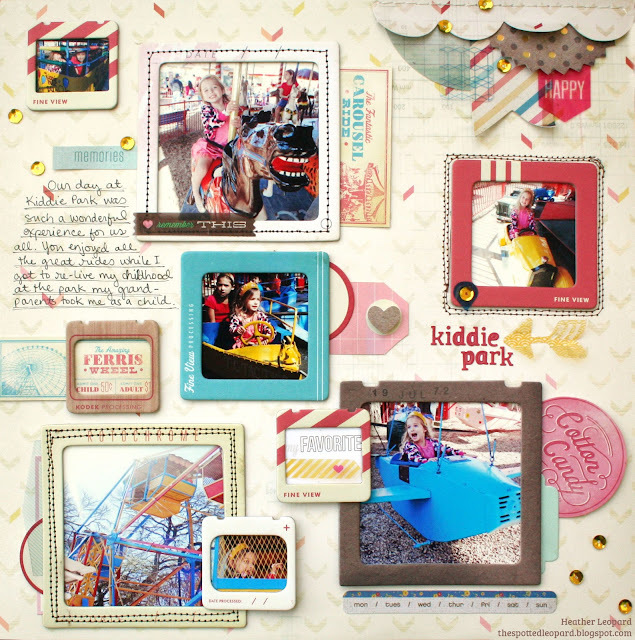 I am so impressed with this layout - it just screams summer, fun, and excitement! Way to go I simply love it!! Newbie to your blog. I look forward to being inspired by your talent. Thanks for sharing this layout, love its busyness and feeling of fun. Really fun page to show off multiple photos - love it! Those frames are so cute! Awesome layout! Love the way you have created with this gorgeous kit! Thank you for your fun inspiration. I am following your blog. Thanks for a chance to win !Great kit! Great layout! Love the layers and details. Oh, What a fun layout! /this reminds me so much of my child hood when we gather to watch photos on slides! Love what you did! What a lovely fun page! Great use for the frames. 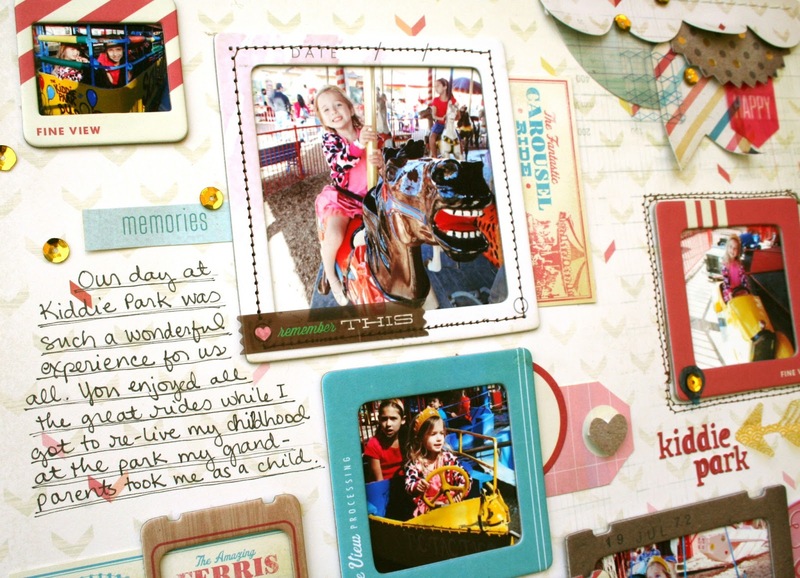 Wow, what a SUPER fun page, I just love how you squeezed so many photos and memories into one space, looks awesome!! 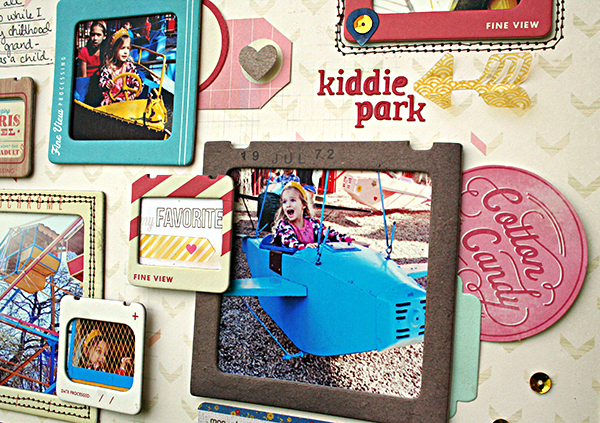 Awesome layout...I'll have to scraplift! Love the touches of gold you did with the sequins in your layout! I am a new follower of your blog by email. Thank you for the chance to win some of your castoffs!! It will be like Christmas morning to the lucky winner. Your layout is so fun!!! I love it! It is so nice to see a busy page with lots of photos. As much as I love simple pages with lots of white space that are popular at the moment, I can't resist a page with lots of photos and journaling which really tells a story through it's content. Awesome page! Love the frames and fun elements! Love your layout! Great job. thanks for sharing. Been a follower for a long time and absolutely love your creations. So far never lucked out on winning any of your generous giveaways but will keep my fingers crossed! I follow your blog through Google Reader and love to see all of your creations. They are inspiring! Already a follower! What a great layout!!! Love your page, so many fantastic details! this is just GORGEOUS--GREAT layering and colors! Great layout, lilybee always has some of the best papers for my projects. Love the layout-I am already a follower! Glad your daughter had so much fun and you are carrying on the tradition of visiting the fun park. The page is really great. The frames really add to it. The frames are great! I'm really starting to feel the sequins now too. Hi from a new follower. What a wonderful bright layout. Awesome use of the frames. What a cool idea for a layout. I love how your layouts are always so different and inventive. Awesome layout! I'm a new follower. Wow what a layout! So much to see and so much fun! Love how you used those frames for this exciting page. I am one of your "Google Friends" and I follow your blog by email....I love all the inspiration I get from your project. You have some awesome ideas. wow awesome page!!! LOVE all of the photos on here and how well this flows! ALways love your work! Thanks so much! amazing layout. It would be so nice to visit the same old park with your daughters. nice memories in the layout. Great details on this layout! I am admiring your work! Thanks for sharing!